Apple’s first news of the event actually came from its Twitter feed, which announced the new iPhone 7 before it ever appeared on stage. On stage, Apple made much of the new design, with Jony Ive stressing that the device has been painstakingly perfected to be as clean and beautiful as possible, and on multiple occasions the new phone was called the best iPhone ever made. Obviously, we’ve heard this before. But that didn’t mean the phone’s official unveiling wasn’t welcome. Both the 4.7-inch iPhone 7 and 5.5-inch 7 Plus come in the usual array of colors, with the added additions of the super glossy Jet Black and the slightly more ordinary Black. They have a 25 percent brighter display, with a wider color gamut for better color management and reproduction. This time around, the antennas are built right into the chassis, getting rid of those ugly lines from the previous two versions of the phone. Internally, the new phones get stereo speakers and a brand new A10 Fusion chip. And, possibly most importantly, the devices are water- and dust-resistant. But we get it: you want to drill into the big changes. Take a look below. This one change will represent a major test of the trust consumers have in the iPhone. Apple announced that, in removing the 3.5mm jack, the included headphones will work over Apple’s Lightning standard. That means you won’t be able to connect your favorite headphones to the next iPhone without an adapter (which will be included in the box, of course). Phil Schiller argued that Lightning is already an excellent audio standard, and that the team behind it is showing “courage” by making the shift. It’ll be a little while before we knew for sure if this was a good idea. To make the transition away from analog audio easier (if more expensive), Apple developed its own standard to allow wireless headphones to connect to the new iPhones seamlessly. Using its own W1 chip, Apple designed AirPods — or EarPods without wires — that connect to the iPhone without needing to pair like you would with Bluetooth. Beats has also developed two new headphones running on the W1 chip. The AirPods will set users back $159, and they’ll have to wait until late October to buy them. Or you can check out the Best Wireless iPhone 7 Earphones with Awesome Music Quality Right Here. One of the iPhone’s most constant, iconic features is gone: the clicky physical button at the bottom of the phone. In the iPhone 7, the Home button is still there, but it’s no longer mechanical. Instead, like Apple’s new MacBook trackpads, the iPhone will provide touch feedback with the Taptic Engine. It’s supposed to deliver similarly satisfying feedback, with custom notification buzzes for things like messages and calls. Will it actually be as satisfying? We’ve had good results on the Mac, but it’s hard to say for sure. What’s the Major Difference Between iPhone 7 and iPhone 7 Plus? 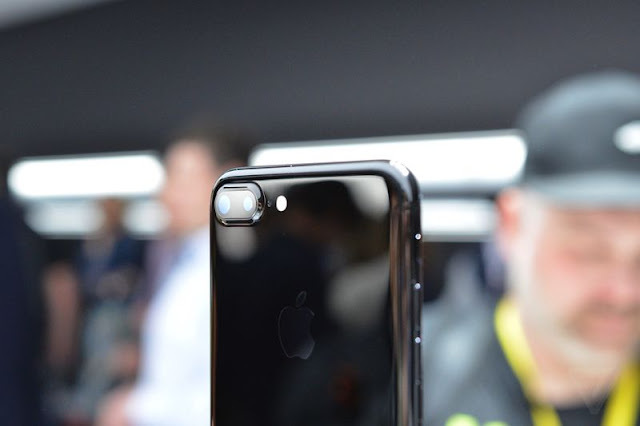 Besides dimensions of 4.7 inches and 5.5 inches on iPhone 7 and iPhone 7 Plus respectively, the bigger version of the iPhone 7 comes with two rear-facing cameras, but it’s not going to let you capture your favorite moments in 3D. Instead, each camera has a different focal length, allowing for users to pick between shooting photos with a wide-angle or a telephoto lens. The iPhone 7 Plus will also be able to do some software tricks using those two different focal lengths. One is called “software zoom,” where you’ll be able to “zoom” in the camera app between (and beyond) the two different focal lengths. The other is called “depth,” and it uses the differences in the lenses to enhance the blur of the background behind your subject — similar to what phones like the recently released Honor 8 are capable of. Now, that’s just the iPhone 7 Plus. The smaller, cheaper iPhone 7 only has the wide-angle camera, but it is at least getting some upgrades from the iPhone 6S shooter. There’s a new 12-megapixel sensor, a new flash, an f1.8 lens. It also comes with optical image stabilization, and Apple says that its new image processor will use machine learning to enable better autofocusing, exposure, and color-correction. Apple made a lot of bold claims about the new cameras on the iPhone 7S, and we can’t wait to put it all to the test.